Rupture of the posterior free wall of the left ventricle. The cadaveric section showed a sternal fracture at the level of the third sternal space, without hemorrhagic infiltration of the surrounding tissues, attributable to cardiopulmonary resuscitation. 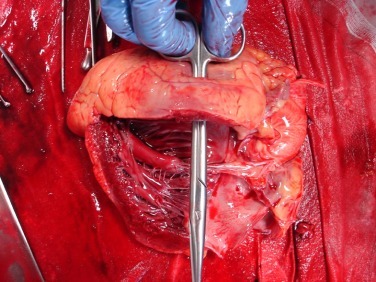 Postmortem examination revealed a massive cardiac tamponade with endomyocardial and myocardial rupture at the level of the posterior free wall of the left ventricle (2 cm in length, Figures 1 and 2). The anatomy of coronary arteries was normal; an uncomplicated atherosclerotic plaque determining 20% stenosis was observed in the left anterior descending artery. Histological sections showed cells with loss of myocyte nuclei, undulated fibers, striations, and neutrophil infiltration of the interstitial spaces. Interrupted muscular fibers and signs of erythrocytes extravasation were observed nearby the site of rupture of the myocardial wall, thus indicating that the rupture had occurred during life. Toxicology screening was performed on biological samples collected during autopsy and on blood and urine samples collected during cardiopulmonary resuscitation in the ED. Gas chromatography–mass spectrometry analysis showed high concentrations of benzoylecgonine, the principal metabolite of cocaine (1.575 ug/mL in peripheral antemortem blood and 1.528 ug/mL in heart postmortem blood). The analysis performed on urine collected antemortem confirmed the presence of high levels of cocaine, of benzoylecgonine, and also of ecgonine methylester. Hair sampling was also positive for cocaine (31.64 ng/mL) and benzoylecgonine (5.07 ng/mg). To the best of our knowledge, this is the first description of cardiac rupture due to myocardial infarction induced by cocaine abuse. 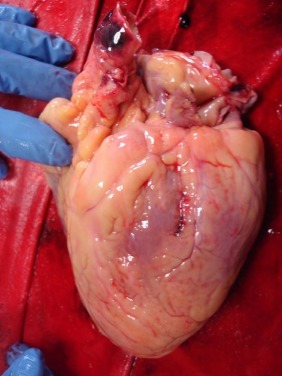 All these findings indicate that this patient’s sudden death was caused by acute myocardial infarction complicated by cardiac tamponade due to a large rupture of the posterior wall of the left ventricle. Blood and urinary concentration of cocaine and its metabolites suggest that the subject had used cocaine (presumably in repeated doses) during the 24 hours preceding death, according to the plasma half-lives of the substance (0.7-1.5 hours) and of its metabolites (up to 48 hours). Rupture of the left ventricular free wall is an infrequent event in human pathology. In rare cases it may occur as a complication of external chest massage. In this patient, however, postmortem findings (presence of perilesional hemorrhage, integrity of the pericardial sac, and posterior location of myocardial rupture) clearly demonstrate that the rupture of the left ventricular free wall was not caused by external chest compressions. In conclusion, clinical history and findings of histology and toxicology all suggest that, in this case, heart rupture likely occurred as a consequence of acute myocardial infarction triggered by cocaine abuse 48 hours prior to death. The repeated consumption of cocaine at close intervals may have induced a rapid increase of heart rate, cardiac contractility, and blood pressure with an abrupt reduction of coronary flow mediated by coronary spasm. This case report suggests that cocaine use may be associated with heart rupture and cardiac tamponade.